Looking for welding training programs in Texas? You’ll be happy to learn that there is a whole bunch of schools that offer certification programs for those who want to become a welder. 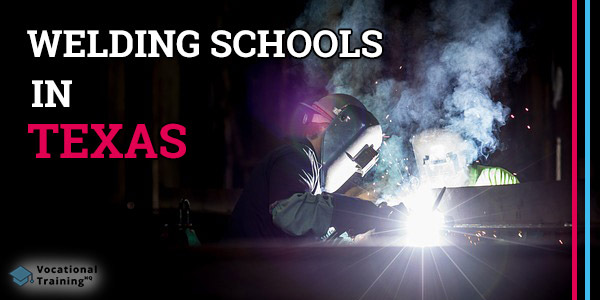 In this article, you can find a list of the best welding certification schools in the state. Moreover, you’ll get some extra info that will be absolutely useful if you decide to enroll in a welding career. 5.2 How to Become a Welder in Texas? An average median salary of a welder in Texas is about $45 250 or $21.76 per hour. A median salary throughout the country is about $39 390. Speaking of the top 10% of welders, throughout the country they earn about $62 100 annually. At the same time, in Texas, they can earn about $70 910 per year. Moreover, welding has a great outlook in Texas so you can find a job easily. The US Department of Labor claims that the number of job offers in this sphere will increase by 22 500. Texas has almost 180 welding certification schools all over the state. Below, there is a table with the contact info of each school. One of the best welding schools in Dallas is Mountain View Community College. It offers training programs for both entry-level jobs and welding inspector jobs. You can find more info on the official website. Among the best welding training options in San Antonio, there is the Southern Careers Institute (SCI). Completing a training program at this school you can work as a TIG, Combo, and MIG welder; fabricator, pipe welder, and/or sheet metal worker. In Houston, there is the Tulsa Welding School. It provides both a Welding Specialist or Welding Specialist with Pipefitting training. Austin Community College is one of the best welding certification school in the state. After finishing your training at this college you’ll be able to start your career as a Certified Welder, Welding Inspector, or Metal Artist. Speaking of El Paso, El Paso Community College provides an absolutely excellent welding training program. The program contains such important classes as fabrication and various welding methods. If you want to become an underwater welder, you should know that there is one school in Texas that offers such a program. It’s a commercial diving school – The Ocean Corporation that is located in Houston. The school has various tanks, a special deck, and diving complex. It has two training programs – Non-Destructive Testing and the Ultimate Diver Training. How to Become a Welder in Texas? Texas has a whole bunch of welding certification school so you have enough options to choose from. You just need to learn about the schools that are interested in and make a decision. It’s your opprotunity to start a great career!